A car navigates a snowy Spring Garden Bridge on March 14, 2017. It's looking like snow will interrupt the short workweek as we come off the long holiday weekend. Meanwhile, the subfreezing temperatures that have cold-cocked the region since Dec. 27 look to hang around through next weekend, according to the National Weather Service. The Arctic high pressure in place over the Philadelphia area will last several more days, but it looks like a coastal storm will develop off the Southeast and move north, intensifying rapidly off the Mid-Atlantic on Wednesday night and Thursday, forecasters say. 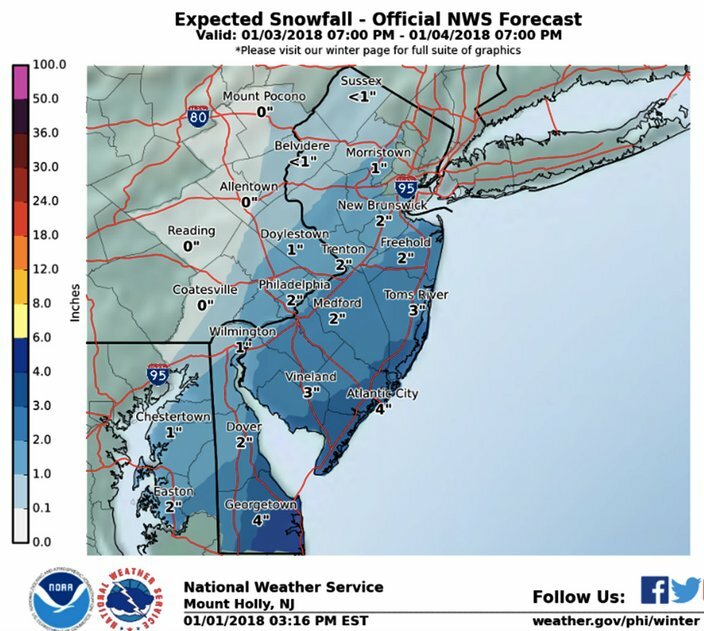 While the storm is forecast to be off the Jersey Shore coast around midday on Thursday, the region could see a few inches of snow along the I-95 corridor from Wednesday night into Thursday night, with as many as four inches at the Jersey Shore. A consensus of recent models sees the western edge of the precipitation reaching eastern Pennsylvania, though the system's track will likely shift somewhat by mid-week, forecasters say, and that would affect snowfall totals. Windy and very cold conditions are likely for Thursday night and Friday as the storm system moves up and over Atlantic Canada. Wind chill values may drop to -10 to -20 in much of our region at that time and maybe around -30 in the Poconos. 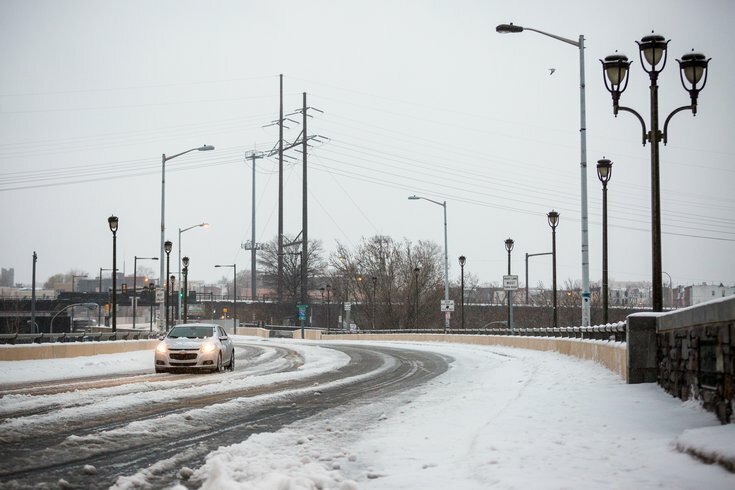 Speaking of temperatures, Philadelphia ended 2017 with a mean temperature of 58.0 F, tied for the fifth-highest mean temperature since records began, according to the weather service. Only 2012, 2016, 1998, and 1931 surpass this mark and 1991 tied this mark. Looking ahead to the weekend, more cold high pressure is expected to move into the region from the west. Early next week, low pressure from the west will bring the chance of more precipitation, though milder temperatures indicate the potential for either rain or a wintry mix. Tonight: Mostly clear, with a low around 12. Wind chill values as low as -2. West wind around 11 mph. Tuesday: Sunny, with a high near 23. Wind chill values as low as -1. West wind 10 to 13 mph. Tuesday night: Mostly clear, with a low around 13. West wind 5 to 8 mph. Wednesday: Mostly sunny, with a high near 30. Light and variable wind. Wednesday night: A chance of snow. Mostly cloudy, with a low around 21. Calm wind becoming north 5 to 9 mph after midnight. Chance of precipitation is 50 percent. New snow accumulation of less than one inch possible. Thursday: A chance of snow. Mostly cloudy, with a high near 26. Chance of precipitation is 50 percent. Thursday night: Partly cloudy, with a low around 10. Friday: Mostly sunny, with a high near 16. Friday night: Partly cloudy, with a low around 6. Saturday: Sunny, with a high near 17. Saturday night: Mostly clear, with a low around 7. Monday: Mostly cloudy, with a high near 38.